The Ham Yard hotel first opened in June 2014. The site (three quarters of an acre) was the last of the London areas hit by the German blitz of the second world war to be redeveloped. The hotel was a brand new construction (at a cost of £90 million pounds). Owned by Tim and Kit Kemp the design (by Kit Kemp and architects Woods Bagot) is said to give an urban village feel The hotel revolves around a tree-filled garden with a bronze sculpture centrepiece by Tony Cragg. More than just a hotel the Ham Yard grounds includes over a dozen independent stores. The hotel has a rooftop terrace and garden with views over Soho and is in bloom all year round. The hotel has a luxurious drawing room and library (with over 2500 books) as well as a spa (massages), sauna, gymnasium, 188 seat theatre with 4K projector, and a 1950's style bowling alley (that's right, the hotel has its own 4 lane bowling alley imported from Texas). The gym is a fully equipped gym with the latest in high tech, and that really does mean high tech, the gym even has a hypoxic chamber to simulate training at altitude and the benefits you get from that. Wireless internet access can be picked up throughout the hotel and is complimentary. The hotel also incorporates a range of specialist independent stores within the building, although you are not short of choice for shopping in the surrounding area either. The Ham Yard has its own restaurant and bar with a frequently changing menu of fresh seasonal British dishes. Outside dining is also possible. The bar also serves snacks alongside the drinks. Afternoon tea can be taken in the restaurant, bar or drawing room. All the bedrooms come with floor to ceiling windows, air conditioning, a minibar and iPod–docking station. They also have an en suite bathroom with bathrobes, free toiletries, slippers, hairdryer, and bathtub or shower and some rooms also offer a balcony or a terrace. Other in–room amenities include telephone, radio, laptop size safe, soundproofing and flat screen television. At Ham Yard Hotel you will find a 24–hour front desk, valet parking and concierge service. Other facilities include luggage storage, room service and breakfast in the room or packed lunches. There are also shops on site and meeting facilities. Nearest: Tube Station: Piccadilly Circus 140 yards (128 metres), Railway Station: London Charing Cross 0.5 miles (0.8 km), DLR Station: Tower Gateway 2.6 miles (4.2 km), Motorway: M1 Junction 1 5.8 miles (9.3 km). 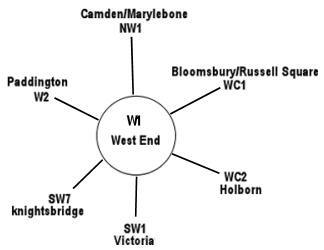 There are 7 tube (underground) stations within half a mile (0.8 km). Central London location nestled amongst the clubs, restaurants, shops and theatres of tourist London. The Ham Yard is literally on top of the main districts most frequently visited by tourists and Londoners alike. The hotel sits on the corner of Ham Yard and Great Windmill Street and this area comes alive at night while still bustling through the day. Pubs, bars and clubs are literally on your doorstep in this area which is part of Soho, famed for its adult entertainment and world class restaurants. Part of theatreland with a dozen theatres within 350 yards, the closest being the Lyric theatre on Shaftesbury Avenue (70 yards). Your 300 yards from Regent Street where you will find a long sweeping road with shops and boutiques with all the famous high street names. Regent Street leads down to Piccadilly Circus with its famous Eros statue at its southern end while Regents Park (1 mile) and London Zoo (1.5 miles) sits at its northern end. Oxford Street (busiest shopping high street in Europe) is one third of a mile to the south while Buckingham Palace is three quarters of a mile to the south west. While Ham Yard itself is a no through road with no through traffic as the hotel sits on the corner with the busy Great Windmill Street you will experience traffic weekdays and evenings. A busy area for London Black Taxis so hailing a street cab normally isn't a problem around here while Piccadilly Tube Station is only 170 yards away (3 minutes walk) and there are 7 tube stops within half a mile. However you could easily walk to many of the best known places of interest from here such as Leicester Square (0.2 miles), National Gallery and Trafalgar Square (0.3 miles), St James's Park (0.4 miles), Covent Garden (0.5 miles) and Whitehall (0.5 miles). Private parking is available on site and costs £55 per day. Soho Hotel (The): is 304 yards (277 metres) away, has a guest satisfaction score of 99% and rates start from about £294. Haymarket Hotel: is 0.3 miles (0.4 km) from here, earns a customer rating of 99% and base rates begin at about £294. Covent Garden Hotel: 0.4 miles (0.6 km), rated at 99% and with rates from around £312. Charlotte Street Hotel: 0.5 miles (0.8 km), rated at 92% and with rates from around £259. Compared to other London hotels: This hotel has been rated 91% by past guests. The London average is 80% and the average for 5 star hotels is 89%. Therefore this hotel is above average for its sector (star rating) and for London as a whole. Firmdale Hotels across the chain average 93% so this hotel is slightly below the guest rating for most Firmdale hotels. Another to Consider: A similar type of hotel (size, rating) nearby (0.1 miles, 0.2 km) would be the 5 star Cafe Royal Hotel London, with rates that start from about £396 and which has a 91% guest satisfaction rating. The Cafe Royal Hotel London also offers: free WiFi. We can also suggest a cheaper options nearby which would be the Sanctum Soho Hotel. 0.1 miles away (0.2 km), has scored 81% from former guests and has rates from around £203 (theres free WiFi too). Prefer a tried and tested hotel close by judged by its guests ratings? We think the 5 Star Soho Hotel (The) stands out in that regard. The Soho Hotel (The) is only 0.2 miles (0.3 km) away. The Soho Hotel (The) has a perfect unblemished customer rating 99%, a truly stunning achievement. The closest fifty hotels around this area (1 Ham Yard, W1 postcode) that are listed on this website cover a 0.6 miles (0.9 km) radius. The star rating breakdown shows 24 five star hotels (average rating 88%), 20 four star hotels (average rating 87%), 5 three star hotels (average rating 85%) and 1 two star hotel (rated 80%). Top rated of the local hotels are Soho Hotel (5 star), the Haymarket Hotel (5 star) and also the Covent Garden Hotel (5 star) (all joint top with 99%). Base Rates: Here we breakdown the starting rates (base rates) by overall average and by star rating. However base rates do not take account of special offers and one off deals so are just a guide. Looking at all the base rates of the 50 local hotels the average rate is £204 per night. Rates range from £18 at SoHostel (2 Star, 80%) and the highest rates top out at £505 at Ritz Hotel London (5 Star, 90%). The following are the rate averages per star level: Five Star average: £280, Four Star average: £147, Three Star average: £110 and Two Star average: £18. We use a proprietary algorithm to rank hotels based on user reviews but adjusting for contributing factors. We rank Ham Yard Hotel 7th (joint) of the 51 local hotels and 5th (joint) for the 24 five star hotels in the area. Our ranking for sheer lowest base rates is 47th of 50 (21st of 24 five star hotels.). To give an overall ranking compared to hotels nearby we combine the rating and base rate scores which gives this hotel a ranking of 29th of 47 for sheer bang for buck (SoHostel was top). Best Newcomer 2014 Mr and Mrs Smith awards.